The focal point for any wedding is the bride, and the dress. She might walk down the aisle in a delicate sheer or make a regal entrance in a dress adorned with beading, embroidery, or touches of gold or jewelry. ... Sheerness and opulence characterize the current trend in bridal gowns. Both types were abundant at bridal wholesale fashion previews this past fall. ... For summer, the wispy sheer look will predominate, says Rachel Leonard, fashion director for Bride's magazine. The dresses typically are worn over non-transparent underslips, so modesty will be served. ... A trend toward bareness in prior seasons continues, however, in sleeveless, strapless dresses with halter tops or deep-cut square necklines. In another continuing trend, dress color is tending toward ivory or cream and away from stark white. ... It's a good bet that brides marrying in cooler weather will select one of the more opulent dresses, perhaps adorned with beading, embroidery, or touches of gold. Some dresses even incorporate jewelry, such as one by Vera Wang with pearls attached to the gown at the neck and draped down the back. Another designer pursued the same idea with rhinestones. ... Designers selected accessories such as tiara headpieces and shoes with rhinestone buckles in keeping with the opulent theme. ... Full silhouettes continue, but leaner shapes were more numerous in the introductions. One newish style is the so-called mermaid look in a dress that hugs the body but then expands at the knee. ... Ready-to-wear houses that have tested the waters of the bridal market in the past few years showed new collections last fall ó a sign that the marriage of ready-to-wear and bridal fashion will continue for a while. ... New to the bridal market this year is Manolo. The Cuban-born designer known for evening wear brought out a collection of party dresses for style-conscious brides. One example is his copper-colored slip dress with a sheer overskirt. ... Most changes in bridal attire are more a matter of slight shifts than major departures. ... "Most people don't want to be too far out at a wedding," says designer Jessica McClintock. "Every bride I have talked to tries to reach into that fantasy that she has imagined for her special day and to dress accordingly." ... McClintock, who designed the sprigged muslin Gunne Sax dress that Hillary Rodham wore to marry Bill Clinton on Oct. 11, 1975, in Fayetteville, Ark., has been around long enough to see wedding fashions come full circle. ... "In the early 1970s, traditional bridal dresses became unpopular as young people wanted to break away from the mold," McClintock recalls. 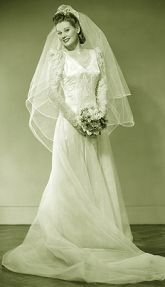 ... By the 1980s, the tide had turned and there was a resurgence of interest in traditional weddings and wedding dresses. ... The perfect dress requires the perfect accessories - and there are plenty you'll need to complete your wedding day attire. ... Depending on the couple's height relationship, some brides wear ballet slippers. These can be purchased at bridal salons or dance stores. The humble ballet slipper can rise to the occasion of a wedding if you have it covered in lace, studded with baby pearls or appliquéd with satin roses. ... It's best to keep your jewelry simple: you don't want it to compete with your dress. If the neckline of your gown is open, a single pendant or strand of pearls may complement the dress perfectly. Diamond or pearl earrings are elegant choices. If you don't own anything appropriate, you might ask a friend to loan you a pair. Something must be borrowed, after all! ... Long gloves may be worn with a sleeveless formal gown or if the gown's sleeves are short. Short gloves are generally worn with longer-sleeved gowns. Make sure you've removed the glove on your left hand in time for the ring to be placed on your finger. ... Delicate lace garters are often sold in shades of blue to comply with the "something blue" directive that nearly every bride follows religiously. One garter may be tossed to the single men at the reception, so you want to buy an extra to store as a keepsake. The color blue has long been a symbol of purity, fidelity, hope and love. In the early days of Judaism, brides wove blue ribbons into their hair. ... Perhaps this is where the "something blue" tradition began. If you don't wear a blue garter, there are other ways to incorporate the color into your ensemble. Use a hankie trimmed in blue lace or wear a piece of jewelry with a sapphire stone. ... In England, it's customary to tie streamers of blue-and-white knotted ribbon to corsages worn by the wedding party. You could tie some to your own bouquet, or simply include a few blue blossoms in the mix.